The second leg of the 2017/18 Vaucluse Challenge took place last Saturday. A crowded harbour and a good 12 – 16 knot NE breeze greeted the DBSC and VYC sailors who competed off Watson’s Bay. Once again DBSC prevailed, although it was a tighter outcome than in November. DBSC came away with 40 points to VYC’s 66 points. In November, it was DBSC 35 to VYC 84. The total for both legs had DBSC on 75 to VYC’s 150. Nice round numbers! There was a good showing from the Vaucluse fleet with a convincing first place in the standards from Matt Faddy, ahead of DBSC’s Luke Parker, and a strong second place in the radials from Rob Perrsson behind DBSC’s Martin White. Both clubs paid tribute to Carolyn Bethwaite by flying their flags at half-mast and sailors had black ribbons streaming from mast tops. After the competition on the harbour, DBSC welcomed a sizable contingent of sailors from Vaucluse to a BBQ on our deck. 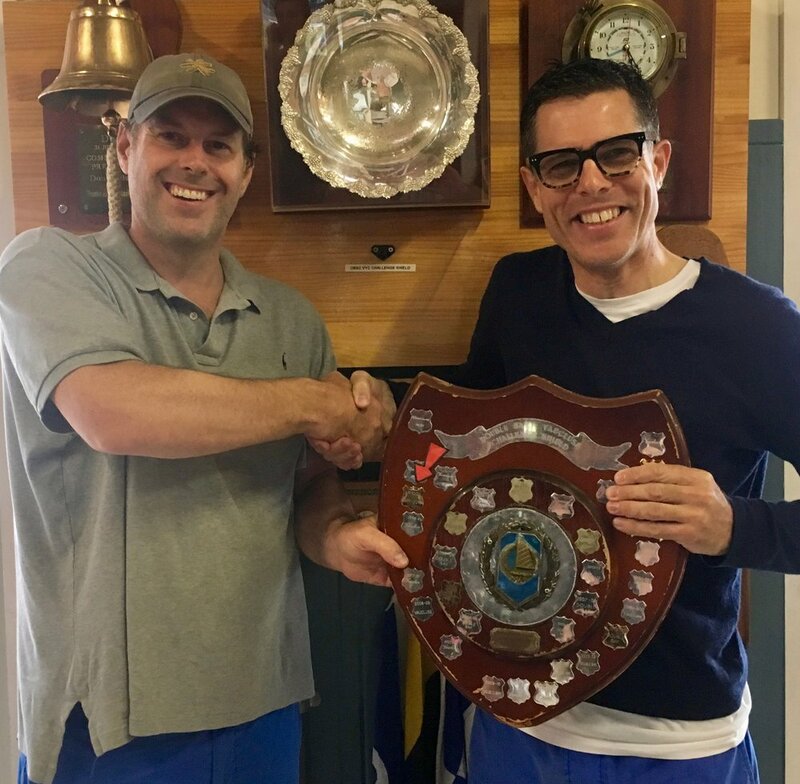 We celebrated Mark Bethwaite’s 70th birthday with a cake and speeches, the results were announced, and the Double Bay - Vaucluse Challenge Shield was exchanged. In all the excitement, we forgot that in addition to the main club trophy, there are also trophies for the best full rig and radial sailors in the Challenge series on aggregate. The winner of the Graham Reid Trophy for the wining standard sailor goes to VYC’s Matt Faddy. For the radials, DBSC’s Jack Littlechild came out on top, and will take home the Dene Bergman Trophy. The trophies will be engraved and presented to the winners in due course. Thanks to VYC for a well-run and enjoyable day of sailing and to Paul, Andrea, Shirley, Deb, Peter and Pat for a great meal. Clare also snapped some great shots of the action – check them out on our Facebook Page, The Top Mark.